Sev Puri is a famous street food of Mumbai. 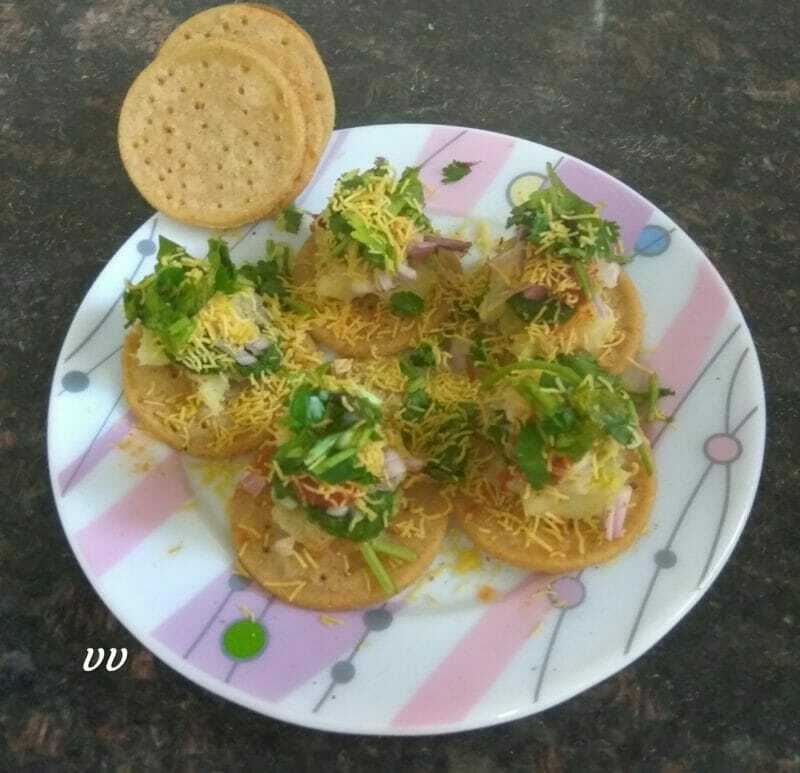 Small puris are loaded with potato mash, onions and three types of chutneys namely tamarind, green and chilli, garlic topped with sev and some lemon juice and chat masala. Generally the puris are made with maida. To make this chaat more healthy, I used jowar flour and it turned out brilliant! They are super crunchy. In a 2 Ltr Pressure cooker add water, salt and ghee. Cook for a whistle. Turn off heat. Release pressure and mix in jowar flour. Close with weight on and let it rest for 15 minutes. Open, knead the dough briefly and divide into 3 balls. Roll the balls into 1/2″ roti. Using a lid or cup punch out small puris. Prick then with fork so that they don’t puff up while frying. Heat Oil in a pan and fry them on medium heat by flipping in between. Once they become crisp, remove and drain the puris on a kitchen tissue. Now arrange 6 or 7 puris on a plate. Load them with small portions of boiled mashed potato, chopped onions, chutneys, coriander leaves, sev and finally sprinkle some lemon juice and chat masala. 1. Water quantity may vary depending on the moisture content of the flour. 2. For non gluten flours, I always follow Autolysis .